Traditionally, enterprise software such as Enterprise Resource Planning (ERP) and Customer Relationship Management (CRM) solutions are managed as on-premise applications, along with other packaged applications or even homegrown applications. In recent years, companies are also rapidly adopting software-as-a-service (SaaS) or cloud applications to remain competitive as they cost lower and offer more agility. 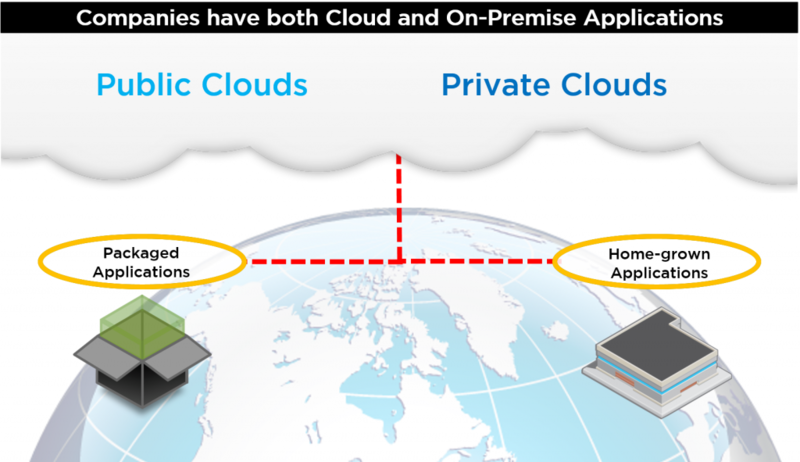 However, even with the adoption of cloud applications, many companies would still need to integrate with their on-premise enterprise applications, as there are a number of other applications which may have dependencies and effects on their data, such as billing, inventory or even a database containing all master data. Custom code – If an organisation has enough IT resources and programmers, they may attempt to create a one-off custom integration. However, this method comes with resource-intensive hidden costs in the form of maintenance, support and development time to adapt to any changes should there be a need to add even more applications to the mix. 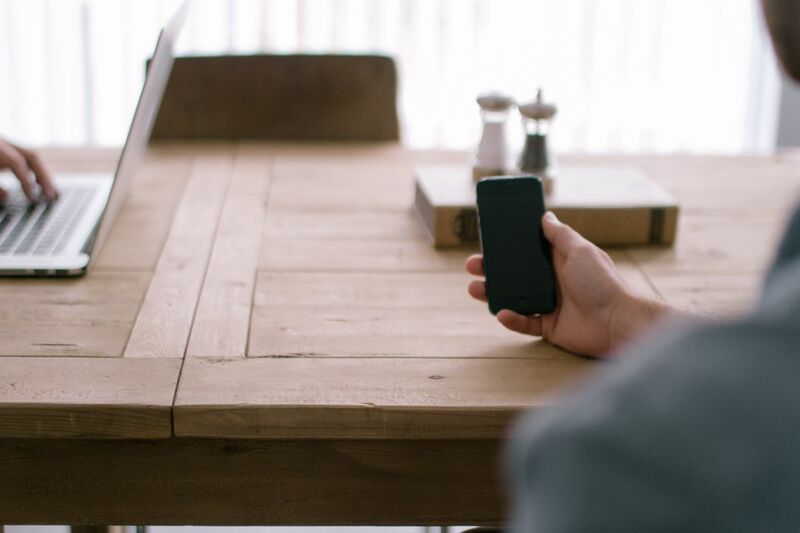 On-demand solution – An organisation adopts an on-demand solution specialising in simple cloud-to-cloud connectivity. While this may be a tempting low-cost alternative for simple cloud integration projects, it does not offer the scalability and functionality to address on-premise or hybrid scenarios as on-demand solutions are not equipped to handle complex processes and back office applications. Traditional on-premise solution – These solutions are typically based on a classic ETL (Extract, Transform and Load) architecture, which are designed for extracting, processing and storing large quantities of data. This older architecture also equates to a longer install and implementation time as well as a much larger IT footprint. 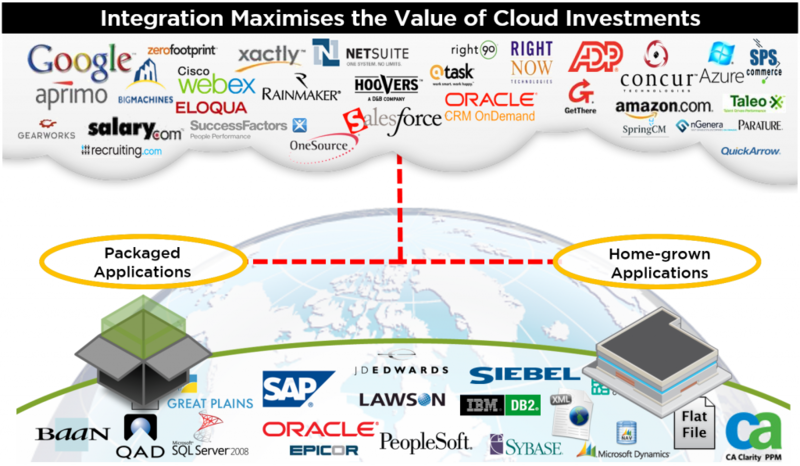 To these solution providers, SaaS applications are still almost an afterthought – they may have a cloud solution as well, but it is a completely separate product to their on-premise solution. So, with this method, an organization will end up purchasing and maintaining 2 or more complex systems to solve one problem. With each of these 3 methods, organizations may end up spending more to integrate their hybrid environments especially if they are supporting a sizable number of applications. This is where companies can consider middleware, which is software that is specially designed to act as a bridge or “software glue” to integrate together separate, often complex and already existing applications in both cloud and on-premise environments. Persys offers middleware that is simple (just like glue) for you apply – you can integrate applications in a hybrid environment easily with a wizard-based, user-friendly configuration and no coding approach. 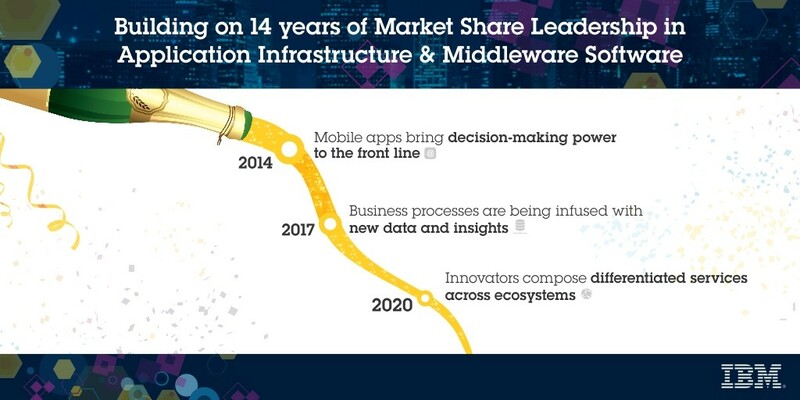 Middleware by Persys builds upon 14 years of market share leadership in application infrastructure & middleware software, powered by IBM. Instead of developing proprietary solutions on our own, Persys builds upon existing established technologies that are widely used globally – while adding to the functionalities & capabilities of these trusted platforms. As an IBM Premier Business Partner, we are able to leverage on IBM’s strength to bring to you the best and proven middleware software while maximising your cost savings. A multi-tenant, cloud-based platform for integrating cloud and on-premises applications and enterprise systems in a hybrid environment. It enables you to configure, run and manage integration in the cloud without any infrastructure footprint. A virtual appliance that can be installed on your existing servers through virtualization technology. Virtual appliances improve the utilization of hardware and enable faster response to demands for newly deployed systems—helping reduce the costs of both hardware and software operation and maintenance. A purpose-built security and integration platform for mobile, cloud, application programming interface (API), web, service-oriented architecture (SOA) and business-to-business (B2B) workloads. IBM® WebSphere® Cast Iron® is a multi-tenant, cloud-based platform for integrating cloud and on-premises applications and enterprise systems in a hybrid environment. It enables you to configure, run and manage integration in the cloud without any infrastructure footprint.enables enterprises to rapidly integrate cloud and on-premise applications – in mere days or weeks instead of months. The integration is simple as it uses a no coding, wizard-based and user-friendly configuration. Transform data by graphically mapping from one or more data sources to one or more destinations. 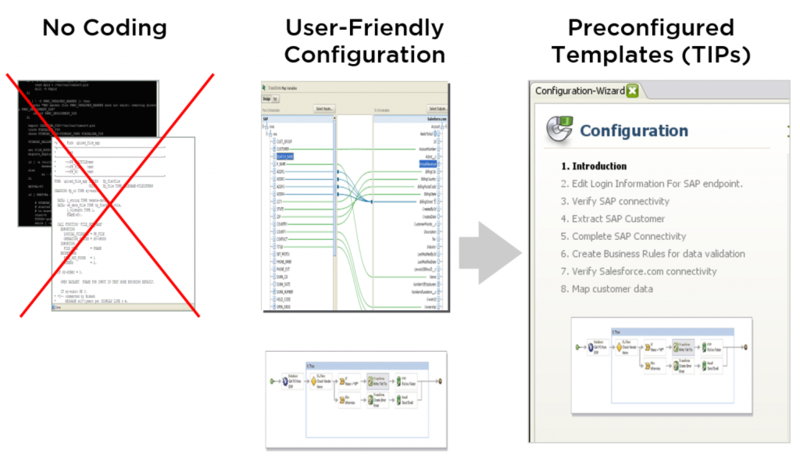 Design integration flows graphically using a configuration without any custom coding. Create an orchestration that defines specific endpoints and the flow of data all without a single line of code. Reorganise, convert, suppress or add data and perform calculations or other complex operations. Choose from hundreds of reuseable Template Integration Processes (TIPs) that are searchable with a single click. Publish these integration flows as APIs directly into IBM’s API management platform. Easily manage and monitor your integration projects through a web-based dashboard. View reports on all integration configurations which gives 360 view of integration environment. 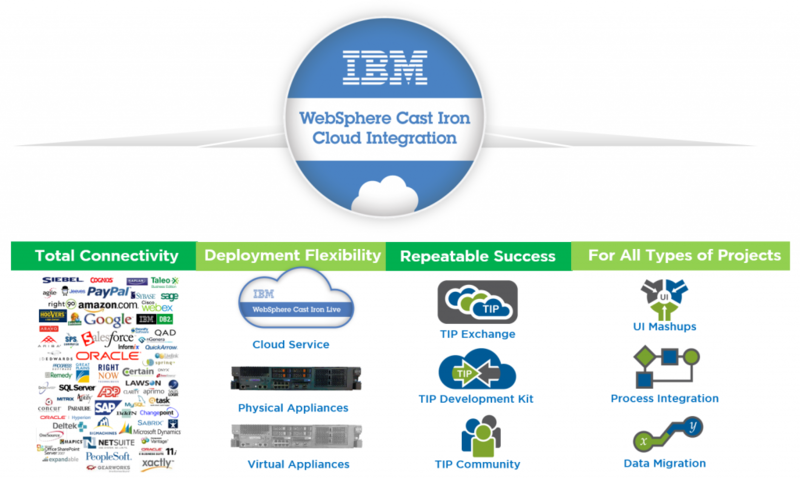 IBM® WebSphere® Cast Iron® offers complete connectivity with out-of-box rich connectors for cloud and on-premise applications. In addition to native connectivity to industry-leading SaaS and enterprise applications, you can choose from hundreds of connectors to applications, which enables you to connect to every type of database, custom application, web service and protocol. It is the only platform available that provides a complete flexibility in deployment options. For example, you can build, run and manage an integration between applications such as SFDC (salesforce.com) & SAP and deploy it using a physical on-premise appliance, a virtual appliance, or completely in our multi-tenant cloud service. It is the only solution that allows for this choice of deployment using the same product and code-base interchangeably. Because of this, it is futureproof, meaning you can start off with one form-factor today, and easily move to another one over-time to scale to your IT strategies. IBM® WebSphere® Cast Iron® integration provides a user-friendly template-based approach via the Template Integration Process (TIP). These are templates of common integration scenarios which can be used as a starting-point for your integration projects, so you don’t have to reinvent the wheel. Cast Iron® gives you the benefit of previous success and best-practices available through our community of customers which equates to repeatable success for your organization’s integration needs. This saves you time and decreases risk. Finally, this is one platform for all types of integration projects. You can use IBM® WebSphere® Cast Iron® integration for data migration, process integration or even for user interface (UI) mashups for taking relevant data from a back office application (i.e. SAP) and displaying it within a commonly used front office application such as SFDC. IBM DataPower Gateway is a purpose-built security and integration platform for mobile, cloud, application programming interface (API), web, service-oriented architecture (SOA) and business-to-business (B2B) workloads. It enables organisations to rapidly expand the scope of valuable IT assets to new channels and use cases and reach customers, partners and employees. It helps to more quickly secure, integrate, control and optimise access to a range of workloads through a single, extensible, DMZ-ready gateway. 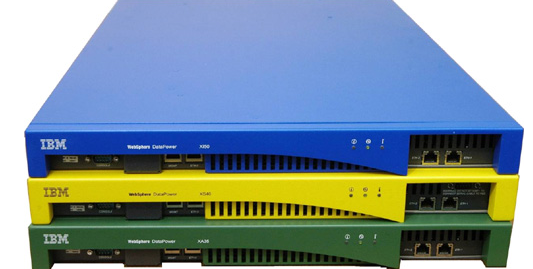 IBM DataPower Gateway is available in both physical and virtual form factors. It delivers Docker container support, Infrastructure as a Service (IaaS) virtual server support using Red Hat Enterprise Linux, enhanced API and mobile security. A single multi-channel gateway platform to secure, integrate, control and optimize delivery of workloads across multiple channels including: mobile, API, web, SOA, B2B and cloud. Converged policy enforcement and advanced security that allows a single entry point to protect and use consistent security policies across business channels – reducing operating costs and improving security. Configuration-driven policy creation and flexible user experience to help reduce time to market, improve productivity and scale expertise. A purpose-built, DMZ-ready and extensible platform that enables business agility, physical security, drop-in deployment and simplified management – lowering total cost of ownership. DataPower Operations Dashboard designed for centralised troubleshooting and real-time operational visibility to accelerate problem determination and resolution. Arrange for a demo today to see how your organisation can benefit from our Middleware solution. You can also contact us to send you case studies of how other organisations have specifically benefited from using it.